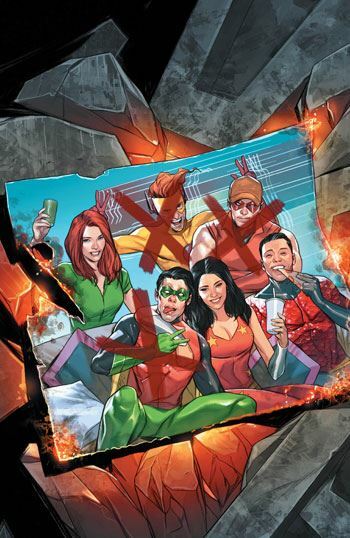 The last two issues of Titans really annoyed me, simply because of the neglect Abnett gave to the events of Heroes in Crisis. The cover for the latest issue gave me high expectations, and I was fully prepared to write a review that conceded that there was a reason for holding off on the deaths of Roy Harper and Wally West until now. So it was all the more disappointing to see how, once again, the deaths of two long running Titans are all but ignored, despite being featured on the cover. Yes, ok, Donna Troy does make some reference to it, although it turns into a monologue about going on without Nightwing leading the team. Wally isn’t even mentioned. And sure, the story as given is ok. Miss Martian gets to be all traumatized as she reveals that she is really a white Martian. Beast Boy gets a grip on himself after running wild. Even Raven has to struggle with her powers. It’s not a bad issue in terms of what is actually delivered to the reader. But how could anyone not feel let down by that cover? I usually enjoy Abnett’s writing, and am still prepared to give him credit if this book ever decides to do a proper tie in and deal with the deaths of Roy and Wally. But it needs to happen. Ignoring it will not make it go away.